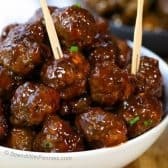 Easy Cocktail Meatballs are a delicious appetizer that can be cooked on the stove top or in the slow cooker. Ketchup and Grape Jelly makes the best ever sauce! Mix together all meatball ingredients just until combined. Form into 1" meatballs. Bake for 18-20 minutes (or bake frozen meatballs according to package directions). Combine sauce ingredients in a small saucepan over medium-low heat. Stir until preserves/jelly melts. Allow to come to a boil for 1 minute. Toss with meatballs and allow to simmer on low 10-15 minutes.